Operam have been named as an area finalist in East of England FSB Awards. The FSB Awards recognise the best small businesses from right across the UK. From every sector and industry and from businesses of all ages and all sizes. In 2018 more than 2000 companies entered the FSB Awards..
And this year the FSB Awards promise to be even bigger, they will be highlighting the most innovative and successful small businesses. Therefore, the winners will be announced at Battersea Evolution on 23rd May 2019, at the prestigious and high profile FSB Awards UK Final in London. 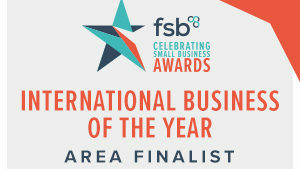 Operam have been nominated as FSB Awards East of England regional finalists in the International Company of the Year category. And will find out if they are FSB Awards UK finalists on Friday 5th April at Newmarket race course. Operam provide a range of specialist products and services to organizations across the built environment in support of their digital transformation. Because we help our customers achieve their business goals for the management of information. Thereby, helping establish a culture of innovation, learning and continuous improvement across their business. Using our digital transformation framework, we help customers to navigate their journey towards sustained success. Whilst our online learning solution, Operam Academy supports individuals on their learning journey. All material within Operam Academy is aligned to a new international standard, ISO 19650. Which was published in December 2018. Above all, Operam Academy ensures learners have the most up to date material on international standards and best practice for the management of information. For four years, Operam founder, Paul Shillcock, volunteered his time to support the International Working Group to produce ISO 19650. In addition, he is the author of ISO 19650-2 and the UK National Annex. And the co-author of PAS 1192-2 and the UK Transition Guidance from PAS 1192-2 to ISO 19650-2. So let’s see why the FSB Awards named Operam as potential International Company of the Year 2019. In addition, providing advisory to government delegations from China to support Centre for Digitally Built Britain. Similarly offering advisory in China too. Which led Paul to being appointed as the Senior Expert for the Global Low Carbon Economy. By the Institute of Global Low Carbon Economy, University of International Business and Economics. And recently Operam supported the UK Department for International trade in Abu Dhabi, UAE too. Further still, in 2018 Operam, worked in collaboration with Royal BAM Group, a European wide construction services business. To build an online learning solution to meet the educational needs of BAM around the new ISO 19650 series of standards. Therefore ensuring that Royal BAM could educate their workforce in a consistent, scalable and fully inclusive way. In 2019 Operam were invited to support the UK government. In an approach to encourage the US government to embrace the new international standards, ISO 19650. Whilst in the future, Operam are part of the joint venture which will support the UK government’s Prosperity Fund. Along with Mott MacDonald, Operam will help up-skill construction organizations in Colombia, Indonesia and Vietnam. Operam’s mission is to make the seemingly complex, simple. Therefore making education on the effective management of information accessible to everyone. Not just the those that work with technology. This is in complete contrast to the usual approach within construction. Which often ignores the people element in adopting change. And makes the mistake of focusing on technology and software. Operam’s approach is focused on the upstream activities. And educating the different management functions. Therefore increasing the chances of providing the right commercial and collaborative environment. Because we need to ensure project delivery teams can exploit the downstream opportunities that effective management of information presents. Operam Academy builds upon Paul’s voluntary work in helping prepare international standards. With the overall aim of helping establish a unified approach and a shared understanding across organization to the management of information. The newly launched Operam Academy aims to help this transition. With the interactive online learning solution helping to educate multi-national workforce’s on the international standards and best practice for the management of information. The new international standard, ISO 19650 was published in December 2018. And it comes at a perfect time. You see, digital transformation has been embraced by many industries. But construction has been slow to react. Especially around the management of information. Although some organizations have already aligned their business approach to the British Standards 1192 series. A new international series of standards should make this approach to managing information in a uniformed way, globally. Therefore, with the publication of ISO 19650 now available, the existing 1192 series will be withdrawn. Because you cannot have two identical series of standards operational. The international adoption of this new series of international standards will see business processes become aligned to ISO 19650. And this adoption will be driven by project requirements and contracts specifying ISO 19650 alignment. As time goes by ISO 19650 understanding should grow and become the norm. The aim is that the ISO 19650 series and processes that align to them will become business as usual for construction organizations internationally. Operam are starting to become the go-to organization to help support adoption of these new standards to an international workforce. The single biggest difficulty faced by Operam has been breaking down the barriers of terminology across a multi-lingual and diverse community of industry professionals. With many international organization having spent time, money and effort in aligning to British standards. Therefore, there is certainly some resistance to a transition to a new international standard. However, the forming of an international series of standards now creates a level playing field for organizations and suppliers around the world. Therefore enabling them to compete, innovate and collaborate. See how Operam have helped other clients. Could we help your organization too? For now, let’s see how Operam get on as FSB Award regional finalists on 5th April 2019. To learn more about ISO 19650 education visit Operam Academy. To learn more about the FSB.